Every area has its own reasons for using raised garden beds in Brisbane & QLD is no different. Raised garden beds are popular in Brisbane, the Gold Coast and throughout rural Queensland for a number of reasons. Practical considerations come first, ease of access, improved drainage and coping with poor soils. In the wet season, soils in Queensland can get very wet, and by raining the garden up a little drainage is improved and vegetable can be grown through the wet season. 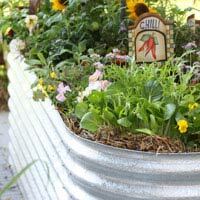 In areas of poor soil, or where rock is present, raising the garden up can eliminate the need to dig, again making it easier to establish a garden. And of course they can also be placed on pavers and hard surfaces for either a temporary, or permanent garden. Aesthetic reasons are second, raised gardens can simply look good, a design element in the garden. From small urban courtyards to larger rural properties, raised garden beds suit individual needs do need to meet a few requirements. If you are using timber, consider using either Cypress Pine or Ironbark. These two timbers are longer lasting than most other timbers. Eco timber which is made from recycled plastic is an alternative, are are concrete sleepers and galvanised iron. For more detailed instructions on how to build a timber raised garden bed watch out video and DIY instructions. Raised Garden Beds in Brisbane and for QLD are available fore sale from the following suppliers.